This time of the year is the time to put one’s life in order. In my oficina I sift through negatives and put them in order and throw photographs that simply occupy space and no more. This find is an exciting one. When I had the good fortune to photograph Joan Jett, when she played at the Commodore, in the late 80s I brought my eldest daughter Ale along. She was a fan. Les Wiseman and I had street credibility because of his In One Ear column (with my photos) for Vancouver Magazine. This meant we got backstage access for interview and photo. I remember just two things. In the sound at the Commodore Ballroom I was chatting with Jett’s manager who had a dinosaur T-shirt. He told me had hundreds of them. During the performance that evening there was a small merchandise booth where I bought for Ale a Joan Jett and Legendary Hearts bandanna that was black with red hearts (or perhaps the opposite!). I have one question to myself here. 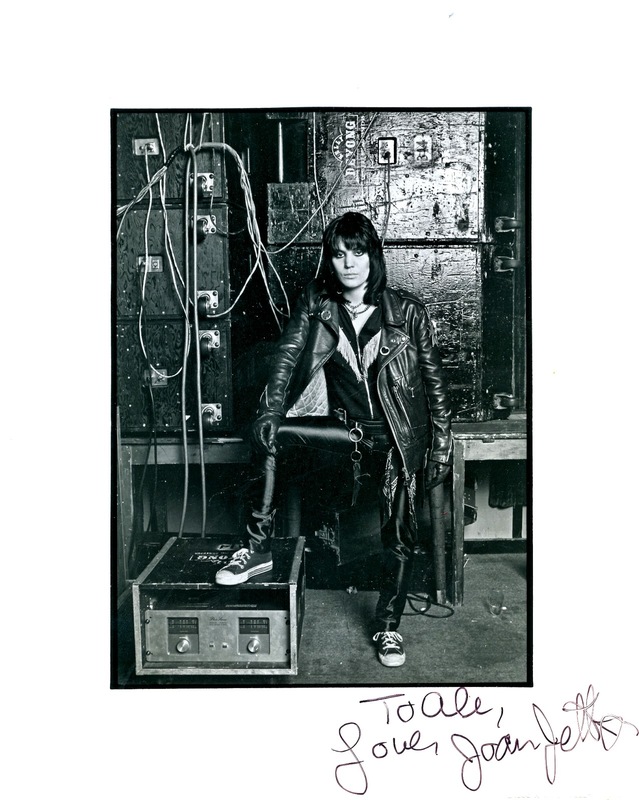 The fact that the photograph is dedicated and signed by Joan Jett suggests I rushed home after the sound check and quickly developed the film and printed. The developing was a tad elaborate as the film was a peculiar film called Kodak SO-II5 that was soon to be re-named Technical Pan film. It was very sharp and it had extremely fine grain (the least grain of any film ever made, in fact! ).